"Our paveflex system gives you the best result. " 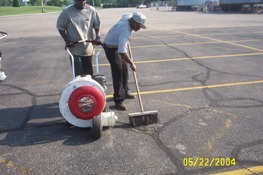 If you consult with any asphalt expert they will conform that unprotected asphalt deteriorates very quickly. 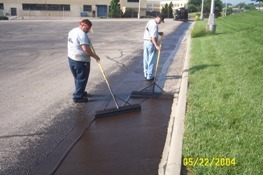 Pavement Solutions Paveflex, a special blend of refined coal tar emulsion meeting ASTM D-5727, mineral aggregate and exclusive modifiers, will protect your pavement. Prevents oxidation: shields against the drying action of the sun. Eliminates weather damage: seals water out so it can not get inside your asphalt to freeze in the winter and break your asphalt or cause it to ravel. Beautifies pavements: Paveflex has a flat, slate black color (unlike most competitor's products) which gives all asphalt that rich, new-look appearance. Reduces maintenance costs: will substantially reduce the need for extensive repairs while reducing annual maintenance costs. Reduces your liability: because Paveflex contains significantly more mineral aggregate than most competing contractor's formulas, our sealed surfaces are skid resistant for vehicles and pedestrian traffic. See the specification navigation bar. Techniques we use sealcoating asphalt.